Apple's stock is trading lower than a month ago -- the day Tim Cook unveiled the iPhone 5S. 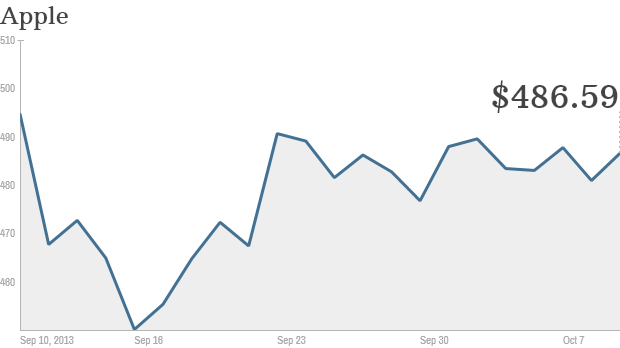 Click the chart for more on Apple's stock. Despite glowing reviews and strong sales, new iPhones haven't done anything to get Apple's stock out of the doldrums. In fact, Apple's stock is trading 4% below where it was a month ago -- the day that Apple(AAPL, Fortune 500) unveiled the iPhone 5S and iPhone 5C. Surprised? You shouldn't be. As CNNMoney has previously reported, it's just history repeating itself. This marks the sixth of the past seven years in which Apple's stock has ended up lower a month after the new iPhone was revealed. And in 2011 -- the one year that Apple's stock actually finished higher after an iPhone release -- it still pulled back sharply from its initial post-iPhone bump. But is this just coincidence? Did Apple's stock really fall because the company couldn't live up to iPhone hype? Or was there something bigger going on with the market at those particular points of time? Let's look at how the tech-heavy Nasdaq -- of which Apple is a big part -- did in those post iPhone periods. 2012: Nasdaq down 4%, Apple down 8%. 2011: Nasdaq up 12%, Apple up 8%. 2010: Nasdaq down 3%, Apple down 1%. 2009: Nasdaq down 6%, Apple down 4%. 2008: Nasdaq down 9%, Apple down 1%. 2007: Nasdaq up 7%, Apple down 7%. That shows no discernible trend. Apple outperformed the Nasdaq a month after the iPhone was unveiled three times out of seven. In the other four years, Apple lagged. 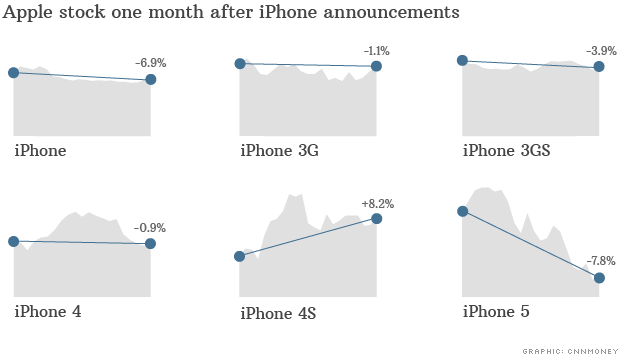 That's why some analysts consider Apple's share price drops following iPhone announcements to be meaningless. "I think the stock movement is somewhat random," said Trip Chowdhry, managing director of Global Equities Research, last month. But others argue that there are legitimate reasons for Apple's stock to fall after iPhone announcements. "I don't think it's random," said Ryan Detrick, senior technical strategist at Schaeffer's Investment Research, a month ago. "We have seen this before. There is so much hoopla with Apple, but soon after the news comes out, there's not as much reason to be excited anymore."